The performances are fine and there's an enjoyably action-packed climax, but this isn't as good as it could have been. 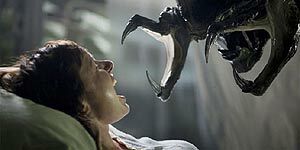 Aliens Vs Predator - Requiem picks up from where 2004's Alien vs Predator left off, with a spaceship-bound Predator giving birth to a weird Predator-Alien hybrid (referred to in the press notes as a Predalien, though it should really be called a Sequeloid). Shortly afterwards, the Predator ship is overrun by aliens and crash-lands on Earth, releasing a cargo of deadly aliens that target the people of Gunnison, Colorado. The ship also sends a distress signal to the Predator home planet, which sends a lone Predator to Earth, intent on killing the aliens and removing any traces of their existence. Meanwhile, the residents of Gunnison - led by ex-con Dallas (Steven Pasquale from Rescue Me), Iraq veteran Kelly (Reiko Aylesworth from 24) and Sheriff Morales (John Ortiz) - band together and try to escape. The performances are fine and the characters are well drawn, to the point where you care about their various sub-plots before the aliens start killing everyone. The effects are extremely good too, although the Brothers Strause have gone a little overboard on the gore - a scene involving a heavily pregnant woman is definitely not for the squeamish. The main problem is that both the script and the direction lack the kind of wit or imagination that might have made this fun - there's only one funny line and only one of the many deaths is played for laughs. Similarly, unlike with the first film, there's disappointingly little interaction between the humans and the Predator - no-one even figures out that there are two types of alien. In addition, the Alien vs Predator fight sequences themselves are poorly lit and confusingly shot, so that it is often difficult to tell which creature is winning. Despite a slow start and some poor direction, the cast and the film's decent climax ensure that this remains watchable, but it's not as much fun as it could have been.